Cheesecake is one of my all-time favorite desserts. Classic cheesecake, pumpkin cheesecake, chocolate cheesecake, fruity cheesecake, carrot cheesecake, gingerbread cheesecake, red velvet cheesecake... I've made them all and loved them all. And while I have seen several recipes for savory cheesecakes, they've always seemed a little too "out there" for me. I feel like having an unappetizing cheesecake is terrible because let's face it - a cheesecake is huge, and that is a lot of food going to waste. So I've always shied away from them, even though I was intrigued. That is, until a few weeks ago. Some of the women on my street get together every so often for girls' night; we all bring appetizers and drinks, and basically we sit around and gossip and chat until the wee hours of the night. Our most recent night however, posed a small dilemma. We were going to be at Georgia Tech all day tailgating and going to a football game, so we weren't expecting to be home in time for me to spend a lot of time making a dish. Therefore, I wanted to have something that I could make ahead of time. I searched and searched for something that appealed to me and that would appeal to my friends (who all LOVE food, so I didn't want to do something plain or generic). Finally I stumbled upon this blue cheese cheesecake. Jackpot! I bought a really nice blue cheese from Whole Foods since it played such a starring role. As the cake baked, I prepared the pear-onion jam, then I refrigerated both components separately. The end result was so delicious. The pungent blue cheese flavor was definitely prominent, but was contrasted nicely by the tangy cream cheese and sweet pear-onion jam. There are so many adaptations as well. Use goat cheese instead of blue cheese, replace the asiago with parmesan, use gruyere... and as for the jam, fig-onion jam would be lovely, as would a jam of apples. I absolutely loved this, and couldn't resist snacking on it all night long. Luckily, we ended up having so much food that there was enough leftover for me to put out a big wedge as an appetizer for our Fake Thanksgiving dinner the next day. 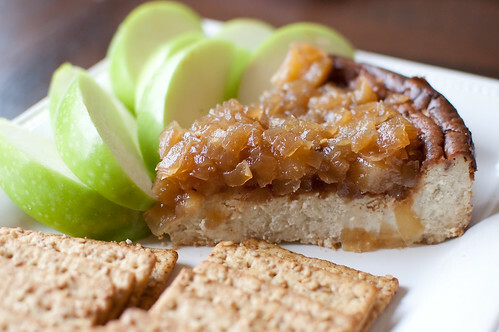 Served with crackers and apple slices, this makes a great appetizer for nibbling, and I think it would make an absolutely lovely addition to a cheese tray as well. Preheat the oven to 350 degrees. Grease a 9-inch springform pan. In the bowl of a stand mixer fitted with the paddle attachment, cream the cream cheese, asiago, and blue cheese until smooth and creamy. Add the eggs, one at a time, beating well after each addition. Add the cream and pepper and mix to combine. Pour the mixture into the springform pan and bake uncovered, in a water bath, until browned on top and barely set in the center, 45 to 50 minutes. Cool completely and refrigerate several hours or overnight before serving. Saute onions in the oil over medium heat until softened and browned. Reduce heat and cook an addtional 10-15 minutes, until they are beginning to caramelize. Add the pears, vinegar, brown sugar, salt, and cayenne. Cook until pears are slightly softened but still crisp. Using a slotted spoon, remove the pears and onions from the skillet into a medium bowl, leaving behind as much of the liquid as possible. Increase heat to medium and cook until the mixture has thickened into a glaze. Mix into the pears and onions, cover, and refrigerate until ready to serve. To serve, pour the pear-onion jam over the cheesecake, then remove the sides of the springform pan. Serve with crackers, bread, or apple slices. I tried a savory cheesecake for the first time just a few days ago. It was so delicious, and I found myself wondering why I hadn't seen more of them. I love the addition of the pear-onion jam on this one. It looks delicious! I've never had a savory cheesecake but I have a few bookmarked, including this one! Yum!! I was looking for a good savory app to make for a party, and when I read this entry yesterday afternoon, I immediately threw all my other ideas away and made this as soon as I got home last night. I haven't tried it yet, but it smells so delicious! I'm just sad I have to wait until the party tomorrow night to try it! Catherine, I hope you like it!! Hi. It looks delicious. How far in advance do you think you could make this? I was thinking 3 days? I think it would be fine, well wrapped. I would just wait to add the jam until you're ready to serve. Hope you enjoy! This was delicious. I think next time I'll try converting to a smaller 4" pan so I don't have such a large amount, but other than that, I wouldn't change a thing. Love the pairing of the savory, salty blue cheese and the pear and onion topping. So, so good. This was wonderful and it received rave reviews at a wine tasting. Next time, I might try finding a similar chutney or jam at the grocery. The pear onion jam was good, but it was not really worth the time and effort. I looooove savory cheesecakes. Yours is real pretty :) Love the 'jam' on top!